We’d love your help. 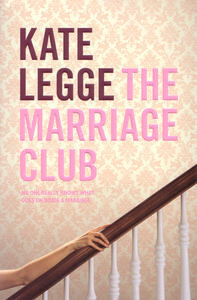 Let us know what’s wrong with this preview of The Marriage Club by Kate Legge. To the world, Leith's life looks picture-perfect. But after her shocking death, her husband George conducts his own post-mortem of their marriage, filling in the gaps. To his dismay, he realises the papered-over cracks in their domestic life run much deeper than he thought. And that he is as much to blame for his as Leith was. Leith's book-club friends also stumble upon the To the world, Leith's life looks picture-perfect. But after her shocking death, her husband George conducts his own post-mortem of their marriage, filling in the gaps. To his dismay, he realises the papered-over cracks in their domestic life run much deeper than he thought. And that he is as much to blame for his as Leith was. Leith's book-club friends also stumble upon the fictions she layered, discovering how little they knew of her private world. Wondering, too, how much they truly know about their own marriages. Not that they would ever let on. To ask other readers questions about The Marriage Club, please sign up. This book is not a great testament to marriage, and while I did find it quite a gripping tale, especially post death of Leith, it ultimately depressed me about marriage in general. Here's to some more positive takes in 2012. Not the greatest book I've ever read. Quite predictable. Didn't really feel much for the characters. But it was a quick read, and I wanted to finish it. Leith Kremmer's friends meeting at their monthly book club think she is very chipper. She even has champagne for them, but none suspect the secrets she has kept. In a way they have all kept secrets and Leith's death has a domino effect. The police begin an investigation, interviewing both the members of the book club and their husbands. Leith's mobile phone hints at the tip of an iceberg. Marriages aren't alway We are not at all sure that a crime has been committed. Certainly a death has occurred. Marriages aren't always what they seem, and sometimes it doesn't take much for them shred. There is a group of women in their late middle age and as one of them is accidentally killed by her husband, everybody needs to reflect on their marriages. An easy read that dissects the unhappiness of a long marriage with surgical accuracy. I would have probably been happier with one marriage less and more depth in each described, as there were some loose ends even after the last page. A lot of questions were not answered and found the writing was a little bit all over the place.